New Zealand is a nation shaped by a Treaty between two peoples, and successive waves of immigration. Its labour market is patterned by ethnicity as well as gender. As in most industrialised countries, women and men typically do different jobs, with further differences for women or men of minority ethnic groups. They tend to be employed in different jobs, different industries, different sectors of the economy. Internationally, this occupational segregation is linked to lower average rates of pay among ethnic minority groups, which may partly reflect discrimination. In New Zealand, Maori and Pacific women (and also men) are concentrated in a narrower range of jobs, mainly low paid, often in the publicly funded health and community sector. Low wages are one reason (alongside casualised employment and high unemployment) that Maori and Pacific families are disproportionately experiencing poverty in New Zealand. Objective assessments to ensure fair pay are important for these communities. Since 1997 the Income Survey of employees each June has been reporting average and median wages by ethnicity, as well as gender. Wages are slowly rising (whether they hold their own against inflation is another story). There are small fluctuations year to year between some groups, but the general trend of gender and ethnicity differences in wages persist over time. The highest line, blue, is Pakeha men. The lowest line, grey, is Pacific women. The graph shows that the difference between the two growing, as part of a general (and gendered) trend of polarising incomes since the 1980s. The following table shows the average hourly earnings for the main gender/ethnicity group in New Zealand as at June 2018, followed by percentage comparisons between the groups. The following table shows the average hourly earnings for the main gender/ethnicity groups as at June 2017, followed by percentage comparisons between the groups. You can see similar figures for recent years here (and for several previous years on request). Within the overall trends shown in the graph, there are fluctuations. The 2015 figures show shifts of a percentage point or so, but little real improvement. In 2014 Pakeha women and Maori and Pacific men appeared to gain a little. In 2013 the relative position of Maori women to Pakeha women and to male groups appeared to improve a little on 2012, with also a slight improvement for Pacific women. Many men from Maori and Pacific communities are in low paid 'male' jobs, or also in undervalued service sector jobs alongside women. Maori and Pacific women earn around two-thirds the average pay of Pakeha men. 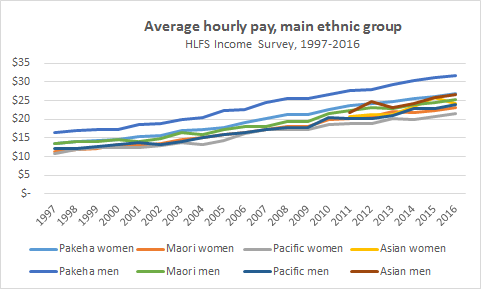 Low average pay among Maori, Pacific and Asian men means the pay ratio of Pakeha women to 'all men' is narrower than their pay gap with Pakeha men. But their ratio to Pakeha men dropped from 85.9% in 2012 to 84.7% in 2013, to 83.7% in 2014, as average wages for Pakeha men rose. This is despite now equal levels of qualifications. Why are there ethnicity gaps? A continuing education/qualifications gap compared with Pakeha partly explains the ethnicity gap. Younger Mäori and Pacific women and men are catching up: those who reach tertiary education do very well. Once they enter the labour market, however, Mäori women earn less than Mäori men, Pakeha women and especially Pakeha men with the same levels of education. As with the earnings gap between all women and all men, occupational differences - and the lower wage levels paid in occupations in which minority ethic groups typically work - is a large part of the 'explanation'. But are these jobs really worth less? Are the skills, responsibilities, effort and work conditions of Maori and Pacific women being properly valued? Independent gender neutral assessments of the jobs that Maori and Pacific women (and men) do would show whether they are being paid fairly. Many of the caring, cleaning and cooking jobs that Maori and Pacific women do are in the public health and education sectors funded by government. The government therefore has a direct responsibility, particularly under the Bill of Rights Act. Maori and Pacific communities - men and women, and especially the young - also bear the brunt of casualised jobs and unemployment. Some of the occupations in which they typically work are particularly vulnerable to 'flexible' hours and job insecurity, which reduces bargaining power. This contributes to large ethnicity gaps in annual and household earnings for both women and men. CEVEP is aware that it will take more than pay equity to sort out all the inequalities in the labour market. But international conventions put New Zealand governments under obligation to address equal pay for work of equal value. Fair hourly pay is a good starting point for working towards a fairer society. Many Maori, Pacific and new immigrant women work in typically female jobs for low pay - food preparation, hospitality, cleaning, caring for children and for old people. Some Maori and Pacific women work in nursing or in primary and kindergarten teaching, where gains have already been made through industrial action to achieve 'pay parity'. In other countries, gender neutral job assessments have found that skills and responsibilities in helping or relating to people are often under valued and under paid. Maori and Pacific women skill's are often developed through voluntary work in their communities, involving traditions of manäkitanga and whänaungatanga. In some paid jobs they may assist with languages or knowledge of cultural traditions without reward. Equal value assessments of low paid, typically female jobs that employ many Maori and Pacific women could result in better pay for them - benefitting also their families and communities.